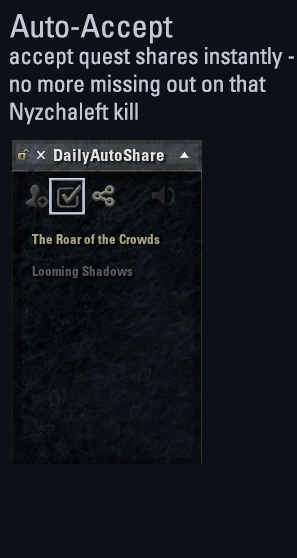 Can now auto-accept / turn in dailies. Daily Autoshare heavily relies on localisation: every quest name is matched against the AddOn's database. To ensure functionality in your language, please send me updated localisations files (DailyAutoShare/locale folder) or create a pull request on github. - Includes sapient Arteficial Intelligence; daily quests will only be shared to players who never bullied Ayantir. Also, we're overdue for Skynet. - Hopefully fixed the quest state display in Clockwork City. There was some confusion with the sublists. - Logs should now correctly consider the quest reset - if you log in before quest reset, yesterday's log will be copied. If you turn in a quest after quest reset, log entries for the same day from before quest reset will be removed. - Cleaned out a lot of unused code. I didn't run into any exceptions while doing a metrick ****ton of dailies on Summerset, so I assume everything still works. - Added LibAsync.lua to manifest. Sorry, polysoft, my bad. - Quest auto-accept and -turnin are now working. Some questgiver names will require translations. - Reverted to 2.9x due to a missing file. Will fix in approx. 2.5 hours. - Removed textures folder from root. That wasn't supposed to be there. - Pointered up subzones instead of setting them manually - why didn't I do that right away? - Added auto-accept / turn-in feature like Dolgubon's Lazy Writ Crafter (thanks for the heads-up, Dol!). Requires localisation to work, so if you want to use it in your language, start translating! - Fixed the spam kick in busy zones. Also changed channel listening check. - Inviting in the gold coast now works reliably, at least for English clients. Spent quite some time fishing there, happily sharing mino. Fixed bingo code for the Wrothgar harpy quest daily, is now no longer barpy. German and French localisation added, due to Ayantir being the greatest thing since sliced bread. Fixed German lua file - again. Can't wait for the API patch when everything will work on quest IDs! DAS now has an option that you can disable, "speak English instead of Bingo". It will warn you that you are going to sound like a fool if you disable it. Fixed a lua error for German clients. More German translation, thanks Snakefish! New fancy feature: Can now turn off / hide quest groups on Vvardenfell! Attempt to fix the error for non-English clients. AddOn will now auto-hide in zones where it's not active. No, really! AddOn will now auto-hide in zones where it's not active. stabbing at "pattern parsing error"
Tweaked around in the code a bit - if you abandon a quest, the GUI should now properly display that. Changed to full internationalisation, the generated bingo string will now always be in English, no matter what language your client is in. fixed the russian string. Again. Hopefully minion will publish it. Add-on will now check for bingo string on zone chat after regex "+", "%?$", "any group for", "can someone share"
Quests can now be (un)marked as completed by a click on the corresponding quest name in the DAS window. Fixed the inverted tooltips for share, also tidied up the backend. New icons! Yay! We're leaving open beta! And now even without unnecessary debug output! Also, added libcustomtitles for the fun of it! Now with an even fancier GUI. And buttons! Someone writing "stop sharing" in group chat now turns quest sharing off until you leave the group. Now has tooltips, buttons, labels and more fancy stuff. I do not declare this stable yet, but it's definitely open beta by now. Thanks for the addon! I'm experiencing a problem where it will continue to spam even after I disable the automatic quest share. 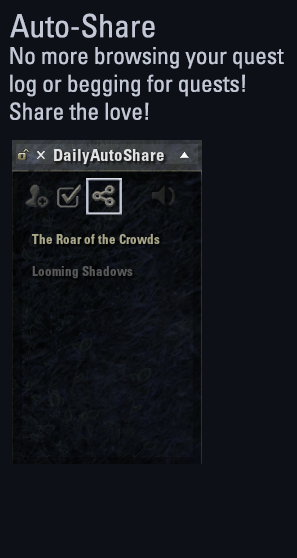 It'll say it's "Not automatically sharing your active daily..." and yet people will still get quest shares. Not ignored you, just waited for Easter so I could check PTS with nothing else in my hair. It also turns the quest share back on when entering and leaving groups. That's a feature, so the quest sharening happens. (Otherwise, people would just turn it off, forget about it, and leech from everyone else). Can you live with that? Thanks for the addon! I'm experiencing a problem where it will continue to spam even after I disable the automatic quest share. It'll say it's "Not automatically sharing your active daily..." and yet people will still get quest shares. It also turns the quest share back on when entering and leaving groups. Got kicked from a boss group today while trying to fix it because it was driving people nuts. Hehe. 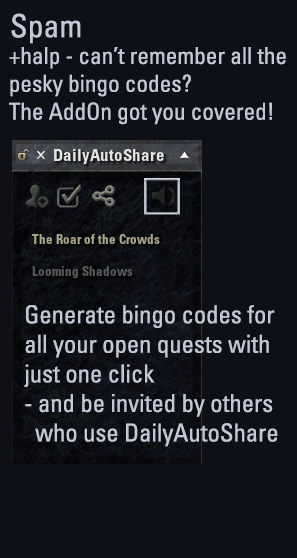 Any chance we will ever have the ability to add our own bingo codes for each quest? 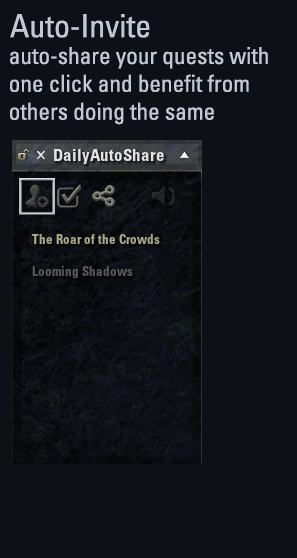 on PC NA for example (now during the DB/TG event) the common shares are 'f' for Folly Tribune (Looming Shadows) where the current bingo code is +mino and 'a' for Arena (Roar of the Crowds) which has a current bingo code of +arena. Swear, I used spam yesterday for arena and rather than type out +arena, someone typed in zone "how about we just type a"
it does listen to +a, however, it takes the first entry from the list for advertising. If you want to fix that, you can find the questdata folder in the addon and open GoldCoast.lua, swap around "arena" and "a" in the list. You'd have to do that after every update, or I'd have to add a check whether the user is on NA server, but it will invite on "+a"
It is, however, not reacting to messages not containing a +. I need to use something to filter chat messages by. Last edited by manavortex : 03/09/19 at 08:03 AM. ah, yes - I had been meaning to complete that at some point. It's currently not implemented, I'll see to it. 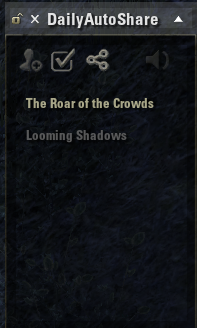 Any chance these can be coded to be passed out not only from the undaunted starting zone but the delve/dungeon/overland zone they are associated with? Be nice to be able to get them or pass them out when you are in a delve/dungeon needed to update them. Many thanks for the consideration and your work on this addon. Re: Re: Re: Re: Re: Re: Missing Quest? Oh, one more thing (bug? ), the quick accept and turn-in doesn't seem to work for any of the world boss dailies that are offered by the npc 'Bolu'. The others, Varo and Towul work fine for me. Last edited by Aerimes : 01/23/19 at 02:26 AM. Re: Re: Re: Re: Re: Missing Quest? Re: Re: Re: Re: Missing Quest? True, I only have 16 on the list. Where do I put Grave Mementos? Delve, boss, or..? Re: Re: Re: Missing Quest? are you playing English or any other language? Hi, im playing English and (might also be relevant) I did't change any AddOn settings, it's all default.